Duck Dynasty is a staple in our family! We have many of the DVDs because we don't have cable to watch them when they come on. We can easily binge watch them on DVD. From the youngest 2 year old up to the oldest.. huhum... me, we love them as a family. 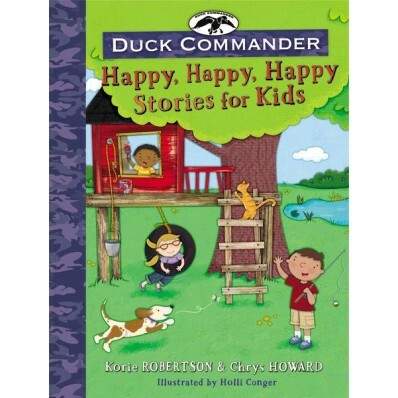 I was super excited to see the Duck Commander Happy, Happy, Happy Stories for Kids available for review with Tommy Nelson. Written by Korie Robertson and Chrys Howard. It is illustrated by Holli Conger. These fun and faith filled stories resonate with kids ages 4-8 but you may hear a giggle or two from some of the older listeners. There are 14 chapters in the book. Each chapter begins with a scripture verse that teaches how we should act or how our character should look. Then the story begins. Each story takes a few pages, illustrated beautifully. The Robertson family antics is a large part of each story. Told in story form like reading a fiction book, so that it feels like you are there at the time. After the story there is another scripture verse. Then there is a section called Lets Talk about it, where you answer questions about the story that was just heard. I love this section because it helps me to know how well my child was listening. With these funny stories, believe me, they are listening. The last section is Duck Commander in action where you are challenged to do something to help you grow in this character trait. To learn from what you just learned. They are not intense or hard. Writing a scripture verse out and tucking it beside your bed, talking to someone you don't know real well, learning patience by playing a board game, or making a list. Not really - we know who they are but have never watched before.